Moving on to this month's reason to join a local guild: charity projects! Crocheters are a group of people who have some of the biggest hearts I know. 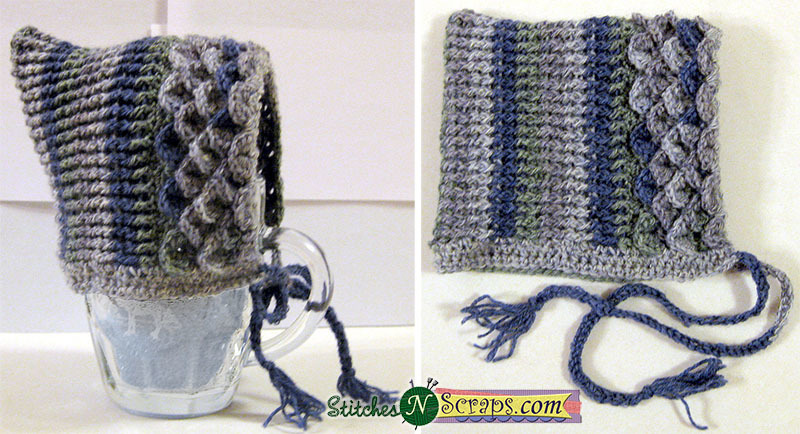 How many crocheters do you know who have never made a project for themselves? And how many crocheters do you know who have spent hours on afghans and prayer shawls, only to donate them to people they've never met? Perhaps that generous crocheter is you! It should come as no surprise, then, that my local guild took on a charity project of its own this year. The project was announced back in January, which is the month I joined. The idea was that each guild member would make a lapghan to donate to a local cancer center. It was not a requirement, but an optional activity for guild members to take part in. Well, I'm proud to say that my guild produced a total of 22 lapghans to donate! I'm sorry to say that the lapghan I had started for this project was not finished in time to join the others, but the ladies in my guild have been so inspiring thus far, and I do intend to take it on the road next month and finish it, and donate it to a worthy cause. I'm Marie Segares from Underground Crafter and this is the fifth post in a monthly series for CGOA Now! where I shine a spotlight on a CGOA member and share a bit of her story with an interview. 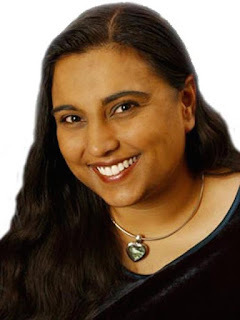 This month's interview is with Pia Thadani from Stitches'N'Scraps. Pia's been crocheting since her mom taught her as a child. 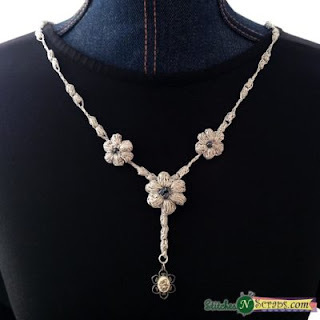 She also knits and has dabbled in cross stitch, embroidery, needlepoint, rug hooking, and scrapbooking. Pia is a crochet and knitting designer who can be found on Stitches'N'Scraps as well as Craftsy, Facebook, Ravelry, and Twitter. All images are used with permission and are © Pia Thadani/Stitches'N'Scraps. Blueberry Hill, free crochet pattern by Pia Thadani/Stitches'N'Scraps. Pia: My mom taught me when I was very little. I think I was about 4 or 5 years old. At first she taught me to make chains by hand. For a while, I just made dozens of very long chains and then braided them together to make jump ropes. It was probably another year or so before I started actually crocheting with a hook. Crocodile Stitch Pixie Hat, free crochet pattern by Pia Thadani/Stitches'N'Scraps. 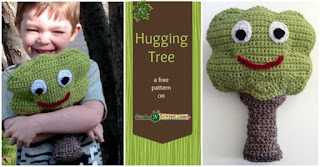 Pia: In 2013, I published what I consider my first real pattern, my Crocodile Pixie Hat. To this day it’s still one of my most popular ones! Hugging Tree, free crochet pattern by Pia Thadani/Stitches'N'Scraps. Pia: I joined the CGOA in 2014, and I’m so glad I did! I can’t really tell you my favorite part, because there are so many good things that have come from my membership. 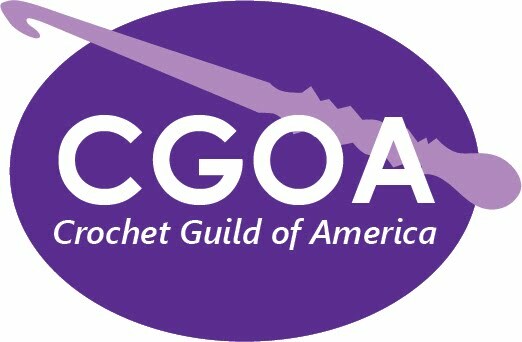 I found a local guild chapter which is very active with monthly meetings, workshops, fun activities, and an annual retreat. I went to the Knit and Crochet Show last year, and found that the discounts on classes and events more than paid for my annual dues. I also completed the Master’s program – which I’ll tell you about next. 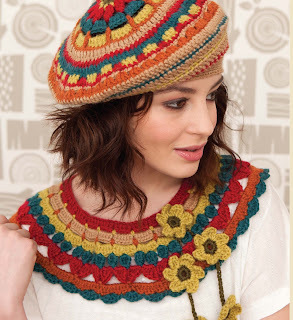 Round the Mulberry Bush, free crochet pattern by Pia Thadani/Stitches'N'Scraps. UC: You completed the CGOA Master's program. Can you tell us about your experience? Pia: When I was looking into the Knit and Crochet Show, I learned that they have a little ceremony each year where Masters graduates receive their pins. I decided right then that I would get my pin at my first show and it would be awesome (and I did, and it was!) The instructions seemed deceptively easy, but I soon found out the reviewers really are looking for perfection, and I had to redo a few of the swatches. The hardest part of the whole process was waiting for the reviews. Somehow, I ended up a lot more emotionally invested in it than I thought I would be, and it was torture waiting to hear back. The review notes were very thorough, and I did learn a LOT about my strengths and the areas where I need to take more care. The Masters committee is made up of really friendly, encouraging people who do actually want you to pass, and are happy to help you get there. As nerve wracking as the process was, the satisfaction and pride in completing it feels amazing. I wrote a little more about my experience here. 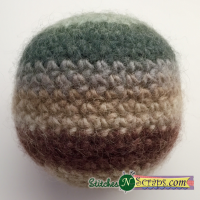 Simple Crochet Balls, free crochet pattern by Pia Thadani/Stitches'N'Scraps. UC: Last year, you wrote a great post about attending the Knit and Crochet Show for the first time. How has going to the conference impacted your work as a designer and blogger? Pia: I was lucky enough to have some on-line designer friends who helped me with what to expect and what to bring with me to make the trip successful from a business standpoint. Getting to meet some of them in person was one of the best parts of the trip. I made some great contacts, and I feel like I came away with a better overall understanding of how the different aspects of the fiber industry (like yarn companies, publishers, and designers) all work together. I learned some of the “who’s who” of different companies, and put some faces to the names. I also spent some time just watching what the veteran designers were doing and who they were talking to. It wasn’t all business though, I had a lot of fun and made some new friends. It was such a great trip that I plan to go back every year if I can. I feel like the more I go back, the more valuable the experience will be each time. Pacific Sunset Mitts, free crochet pattern by Pia Thadani/Stitches'N'Scraps. Pia: I like working with sport or DK weight yarn. A relaxing project for me would be something made all in one piece, without a lot of ends, preferably in a stitch pattern I don’t have to concentrate on too much as I’m usually watching tv at the same time. Dew Drop Necklace, free crochet pattern by Pia Thadani/Stitches'N'Scraps. Pia: Thread or complicated lace is challenging for me, but I also don’t particularly enjoy it. My favorite challenge is actually working out a new design. Figuring out how to make the yarn do what’s in my head, preferably in a way that’s easy for someone else to follow, is a little like solving a puzzle…and I love puzzles! 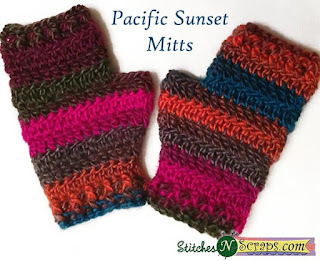 Ribbed Fingerless Mitts, free crochet pattern by Pia Thadani/Stitches'N'Scraps. Pia: Non-size specific items. 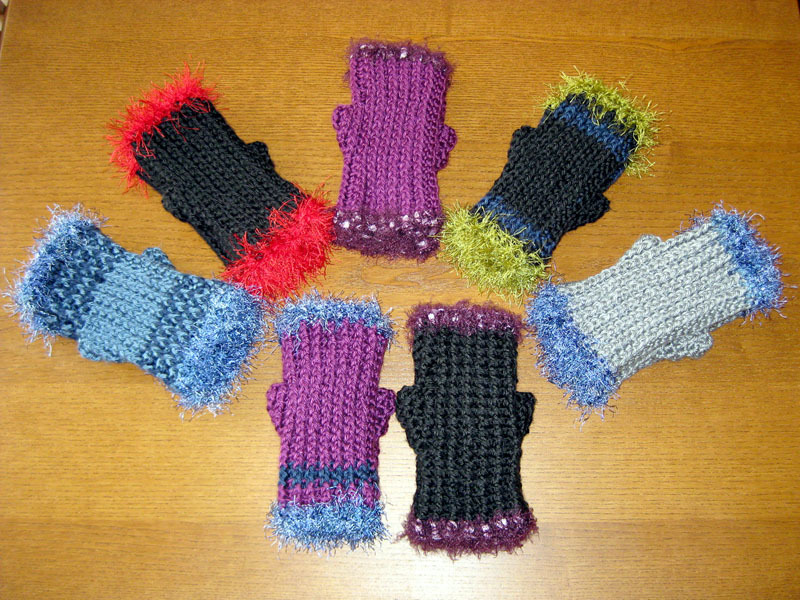 These stretchy, Ribbed Fingerless Mitts are one of my favorites because they fit everyone. Shawls and scarves are another go to. Hats can be ok if there’s enough stretch that they can fit a variety of sizes. Twilight Reverie, free crochet pattern by Pia Thadani/Stitches'N'Scraps. Pia: A little bit of everything, really. It feels like 2016 was already filled by the first week! I’m excited to have lots of opportunities to work with other designers and groups this year, including a contribution or two on this blog. I’ll also be designing a pattern for the Holiday Stashdown CAL, and one for the Moogly Afghan CAL. I would like to work on getting some patterns published in print publications as well if possible. Other than that, I plan to focus this year on developing and sticking to a more regular blogging schedule, including writing more patterns. I found I didn’t have a lot of summery handmades to wear at the show last year, so some of those new patterns are likely to be wearables as I try to build my personal wardrobe a bit. Thank you so much for sharing your love of crochet with us, Pia! Welcome to Part 7 of our Across the Board CAL--and the final strip in our Across the Board Afghan! For those of you just joining, everything you need to know about the CAL can be found on this post. This segment is brought to you once again by Unicorn Fibre. This is your final chance to win their Baby Unicorn gift set! It contains 4 oz each of their Fibre Wash, Power Scour, and Fiber Rinse products, all topped with a sweet baby unicorn plushy. This prize is being shipped directly from Unicorn, and is available to be shipped in the USA only. Enter the giveaway through the Rafflecopter below for your chance to win! Entries will be accepted from May 23rd through June 5th, 2016, and a winner will be selected on Monday, June 6th. This segment's strip is Loop the Loop by Delma Myers, an accomplished designer and author known for her afghan patterns. Once you learn the chain loop technique of creating a surface braid effect, you'll be wanting to incorporate it in all your projects! The pattern can be found on page 14 of the Across the Board 2015 booklet. I've always thought the granny square was the perfect design for a new crocheter to learn. They're fast and easy, and can be joined to make almost anything. This book puts a colorful, modern spin on the granny square and takes it to a whole new level. It introduces a variety of new techniques and shapes, all used to create 20 stunning designs. The patterns and pictures explore a variety of color combinations, from bright and bold, to more muted and neutral. A few of the projects are small, fast, and perfect for craft fairs - there's a shawl pin, headband, purse/bag, and a pretty decoratvie bowl. 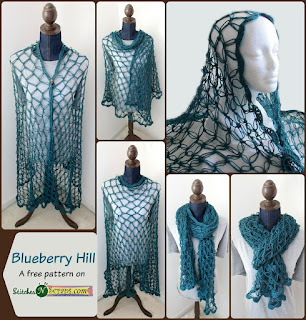 Other designs are wearable, including slippers, a hat, a wrap, and a couple of different tops. There are also eye-catching home accent pieces like a pillow cover, stool cover, rugs, a giant cushion, and more! This is a great resource for beginners too. It takes you through all the details, starting with what tools and notions you need and how to choose them, followed by a discussion of different yarns and yarn weights, and tips on tension / gauge. Next is a series of illustrated tutorials on basic stitches and techniques for joining and seaming. Since this book was published int he UK, it uses UK terminology which is different from US terminology. For example, what we call a single crochet in the US is a double crochet in the UK, and our double crochet is their treble. Here's a conversion chart that shows the differences. With the step by step, illustrated instructions provided though, it's always very clear which stitch is being referred to by a particular term or abbreviation. There is also some valuable information about blocking, care instructions, and some tips on how to deal with common problems you may run into. 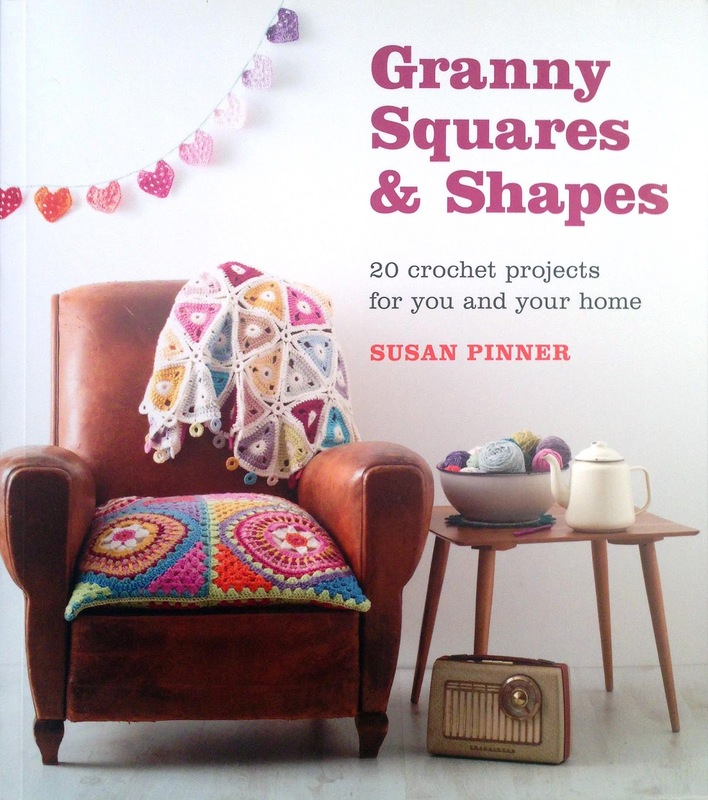 This first part of the book ends with instructions on how to create the basic granny square designs in various shapes. Now that you have the basics down, the book gets into the actual project instructions with all their fun variations. If you're a brand new crocheter, looking to take it up a notch with some fun new ideas, or even if you just love granny squares and motifs, this book is a must have! It would also make a great gift, as there's something in it for everyone. 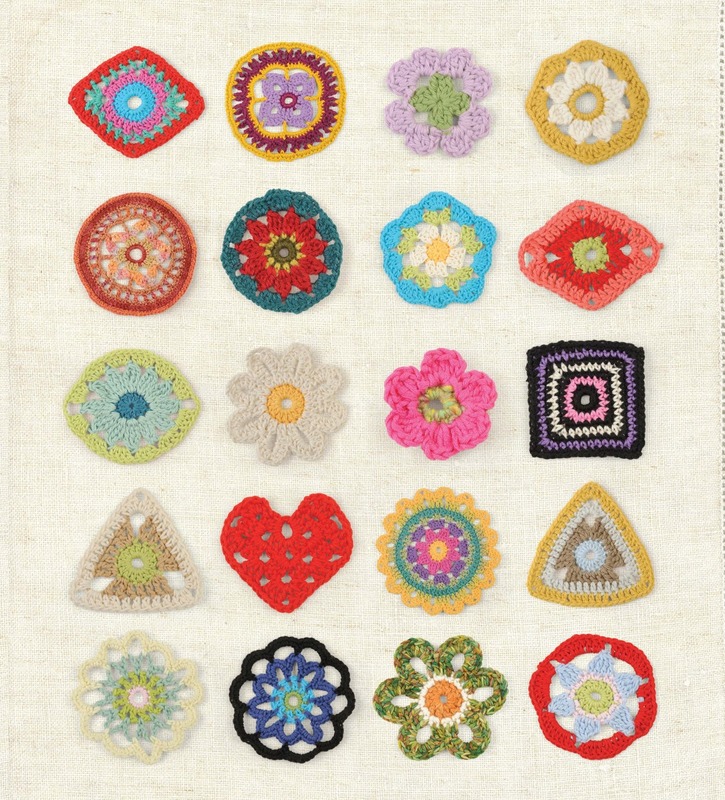 Disclaimer: A free review copy of Granny Squares & Shapes: was provided by GMC Publications . Although I accept free products for review, I do not accept additional compensation, nor do I guarantee a positive review. My reviews are based entirely on my honest opinions. All images of interior pages were provided by the publisher and are used with permission. Where You Like to Crochet and May's QOTM! Well, hello there! The response to April's Question of the Month was fantastic and it was fun to hear everyone's favorite places to crochet. Without further ado, let's get into it! 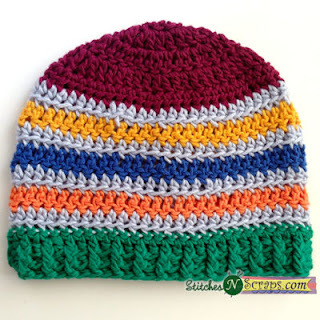 Right here on the blog, we had two fantastic commenters sharing a common crochet place. Both LilPhanie and an anonymous commenter shared they love crocheting at home. The anonymous commenter has a special crochet corner, while LilPhanie prefers a comfy chair, although she will crochet around town, citing a few different places. I love getting up early on weekends (when everybody is still sleeping) to crochet in the living room. I usually get to see hummingbirds at the feeder!! Home is where the hook is for more crocheters on facebook, like Linda, who uses crochet to enjoy those precious few moments alone. Sitting in my LazyBoy Recliner Sofa, with soft music, and a beverage, with nobody home. Martha, Jan, Michele, Agatha, Stacy, Cindy, and Linda W. also crochet in the home, whether it be in a comfy chair or a favorite room. Some like Netflix on the TV, while others prefer music. Good lighting is a consistent theme. Stacy set the following scene. Cat and dog happily sleeping in their beds, my very comfy recliner with 2 lamps on the sides, a movie On Demand or binge watching shows on Netflix, Hulu or Amazon and some chocolate. 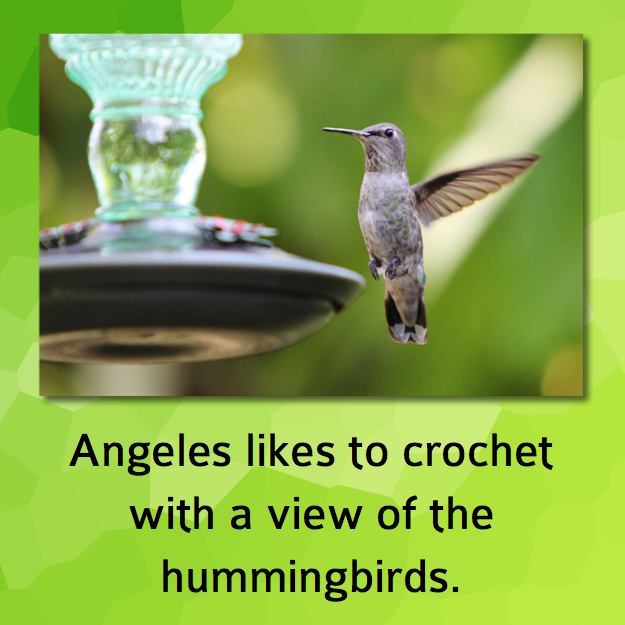 I love crocheting in a nice comfy chair outside listing to the birds sing and the dogs play." [My favorite place to crochet] is in the car on road trips! I always pack a bag of yarn and aim to finish a scarf by the time I get home! Fabulous! My very favorite comment was from Jean, who loves to crochet ANYWHERE! 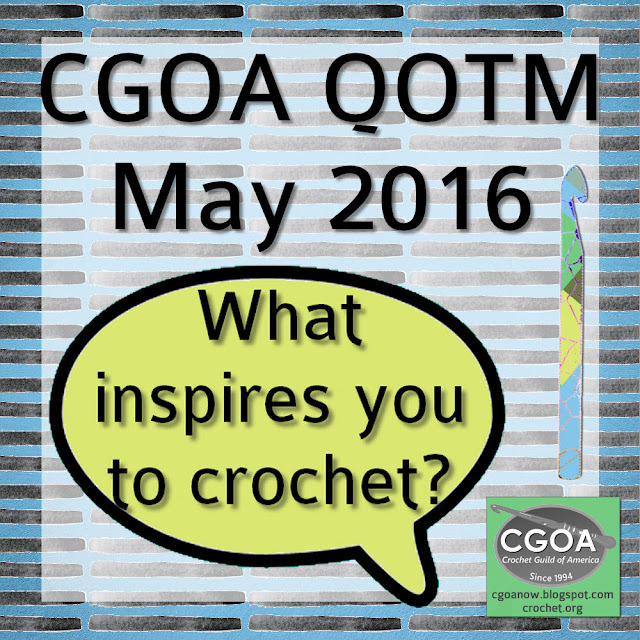 For this month's question, we'd like to know about what inspires your crochet. My crochet is inspired by community. Crafting and sharing my love of crochet with others. But what inspires you to crochet? Please comment here on the blog, or on facebook and you may be featured in the next QOTM post! I need to know what makes your crochet tick, so let's keep the conversation going. Are you inspired by patterns? Yarns? History? Nature? Please leave a comment here on the blog, and let's connect on social media! I can be found on facebook, twitter, Pinterest, Instagram, Tumblr, Google+, and YouTube. Join my monthly newsletter about crafts, crochet, and education. I'm now on Snapchat, too. Lots of fun! Thanks for reading! Welcome to Part 6 of our Across the Board CAL! For those of you just joining, everything you need to know about the CAL can be found on this post. This segment is brought to you again by Ancient Arts Fibre Crafts. 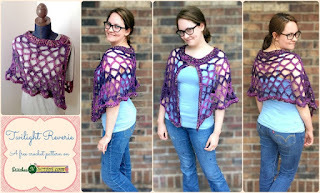 For those of you who coveted their new Reinvent yarn from the Skipping Stones segment, you have one more chance to win with this segment's giveaway! Reinvent is designed to appeal to the environmentally conscious customer who desires a luxury yarn that respects our planet. Made from reclaimed new fibres this beautiful yarn incorporates multiple trends in the knitting world, dyes beautifully, and provides a fabulous knitting, crochet, or weaving experience. With lots of yardage this yarn is suitable for a wide range of projects, and is competitively priced. Fiber content: 49% Wool / 34% Mohair / 11% Nylon / 4% Acrylic / 3% Silk. 400 meters / 437 yards per 100 gram / 3.5 oz skein. The winner will have their choice of colors from their new Denim Collection set of color ways. Enter the giveaway through the Rafflecopter below for your chance to win! Entries will be accepted from May 9th through May 22nd, 2016, and a winner will be selected on Monday, May 23rd. This segment's strip is X's & O's by Susan Sullivan, current president of CGOA! Susan's strip gets back to basics with the soothing rhythm of traditional stitches. While the pattern alone is stunning enough to justify being worked in solid color, Susan adds pops of color in the form of French knots for a finishing touch. This pattern can be found on page 13 of the Across the Board 2015 booklet.